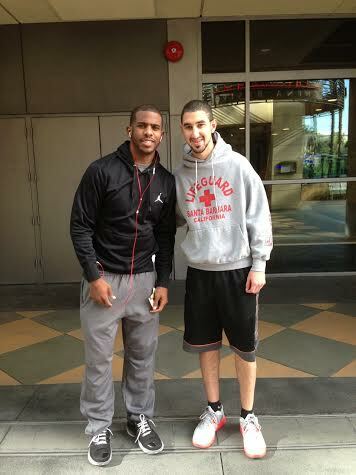 Recently, Los Angeles Clippers superstar point guard Chris Paul was seen at the Sherman Oaks Galleria, in Los Angeles' San Fernando Valley. Paul, who has been out of action since early January (shoulder injury) resides in a gated community in nearby Bel Air. Our source noted how incredibly friendly Paul was to fans and well-wishers, posing for photos and shaking hands with many of the folks who said hello. Paul hopes to return to the court in time for the 2014 NBA All-Star Game, slated for February 16 in New Orleans. While the Clippers continue to play well, without question, if the team wants to contend for a title, they most certainly need Paul running the show and handling the ball. NBA fans can also view an iFolloSports.com story, involving Dwight Howard spending time at the very same Sherman Oaks Galleria, prior to his departure for Houston.